If you are looking for an interesting and exciting way to spend your next holiday vacation, consider a sailing holiday vacation from Sailing Ship Adventures. We offer a wide variety of sailing holiday getaways to destinations throughout the world to provide our guests with a holiday vacation experience that is as memorable as it is unique. Whether you're more to trade snowmen for sand castles, ring in the New Year while swimming with dolphins, celebrate Valentine's Day in the Caribbean, or watch a fireworks display from the deck of a tall ship, we have the perfect vacation for you. Every holiday sailing vacation from Sailing Ship Adventures is an opportunity to experience the sea like you never have before. Enjoy traditional cruise activities like dancing, dining, and evening entertainment as well as swimming with dolphins, deep sea fishing, scuba diving, snorkeling, and wind surfing. Of course, your holiday sailing vacation won't be spent entirely at sea! 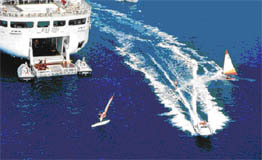 Once the ship pulls into port, our guests will be treated to an itinerary that's a veritable smorgasbord of activities. Just some of the activities available to you on a holiday sailing vacation from Sailing Ship Adventures includes swimming and snorkeling from beautiful beaches, golfing on some of the finest, most challenging courses on the islands, shopping, dining, dancing, plantation tours, hiking and nature tours, and more. Start Planning Your Holiday Sailing Vacation Today! For more information on our holiday sailing vacations, or to start planning your own, call us at 1-877-882-4395 or fill out this online contact form.